Most companies have precise corporate values, usually containing strong positive cultures and corporate philosophies. Corporate values can help companies engage consumers and employees. It is a company’s values that help bring about the kind of business behavior that the company needs to achieve it’s strategic and operative objectives. Organizational changes—especially those are strategic—require a completely new array of attitudes, behaviors, and mindsets. The attitude of compliance—doing what’s been told—cannot bring about widespread organizational progress. To enable employees to assume responsibility, implement initiative and be directly accountable for the organization’s success, they need to be continuously reminded of corporate values. Far from mere words on a piece of paper, companies expect employees understand that “living our values” as part of the fundamental performance objectives for employees. Top performers intentionally connect values and operations and their management practices are effective in fostering values that bear influence on their performance assessment. 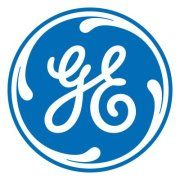 During the Jack Welch era, when General Electric (GE) first started considering assembling a list of core values that would set GE apart from the completion, over 5,000 employees who took training at GE’s famed Crotonville training center hammered out a values statement over a three-year period as part of their training classes. 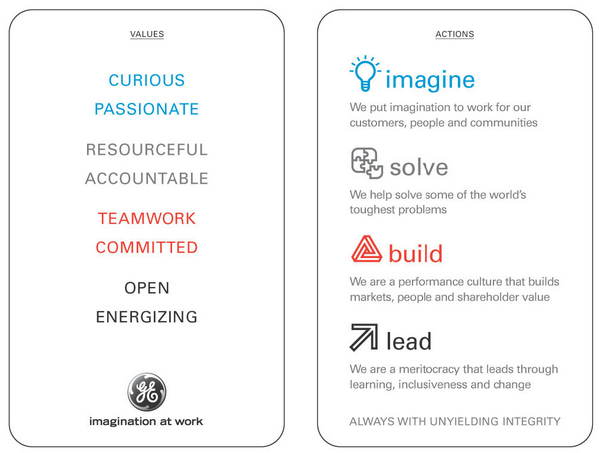 These values were so important to the company that General Electric put them on laminated cards that employees were required to carry with their identification badges.